Colossal lashes in just one go! 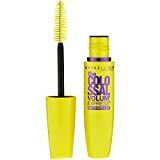 Give your eyelashes the volume they deserve with Maybelline New York’s Volum’ Express The Colossal Waterproof Mascara. With collagen infused in the volume-plumping formula, the Mega Brush instantly achieves 9 times the volume in just one coat, all without any clumps. The mascara’s lightweight formula will help your eyelashes reach the dramatic volume you desire. The waterproof formula has been ophthalmologist tested and is safe for contact lens wearers. Available in 2 highly pigmented shades: Glam Black & Classic Black.